I worked for several seasons (2008-2010) on Iron Mountain hand crew suppressing a full range of wild fires. Working on a hand crew entails clearing fuels and creating a fire line which is often back fired into the larger fire. The use of hand tools such as a Pulaski, a modified shovel, and chainsaw are essential items that are maintained and used daily. A hand crew consists of twenty people who work side by side for 16 hour days and are gone most of the summer for 14 to 21 days at a time. My first season 2008, was a crazy one with numerous lightning fires and days off were limited to only two days off a month for the majority of the summer. During my time on the hand crew I worked as an EMT, Class A chainsaw operator and drove a government 4×4 vehicle. I have created maps for Incident Management Teams in all aspects of fire fighting for operations, air support, ownership, public information, briefing and progression maps just to name a few. The picture to your left is of a briefing area map that has to be visible to everyone at the briefing. That can mean an audience of over 100 people. Some of these briefing maps have been as large as 128″ x 128″ or roughly 10′ by 10′! Printing these maps on a 36″ wide plotter can be a challenge at times especially when artifacts start appearing at 4 am and the map is needed for a 07:00 briefing. Every 12 to 24 hours is a new cycle (depending on if we are working for the state or the feds) and map products are remade with updated information from ground truth-ing, aerial surveys or nighttime infrared imagery. This information is then used to update maps in a Fireline Incident Mapping Tools (FIMT) within ARC GIS. This allows us to manipulate many map products without having to duplicate the information across all maps – update FIMT and it updates on all the map products. In theory the process is streamlined but in practice many things can and do go wrong. At times it has nothing to do with computers – it could be a diesel generator having engine troubles, a plotter that goes down at 2 am during mass printings, or operator error. We create 10 to 20 different map products and produce 100’s of maps a day on large active fires. Below are just some of the examples of maps that I have created and can share (we deal with sensitive data while working on wildfires). 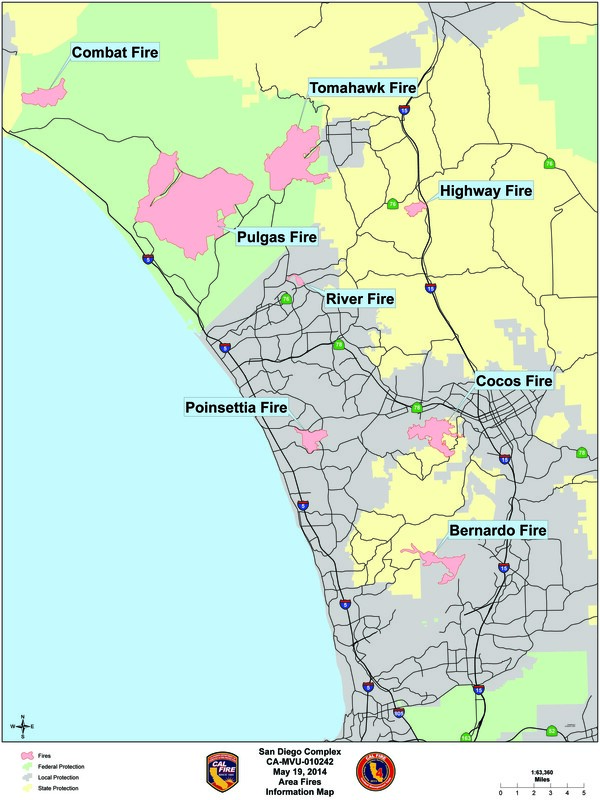 San Diego Complex – A overview map showing the multiple fires within the complex. Lodge Fire – Operations map with colored areas indicating what area is covered by what division. 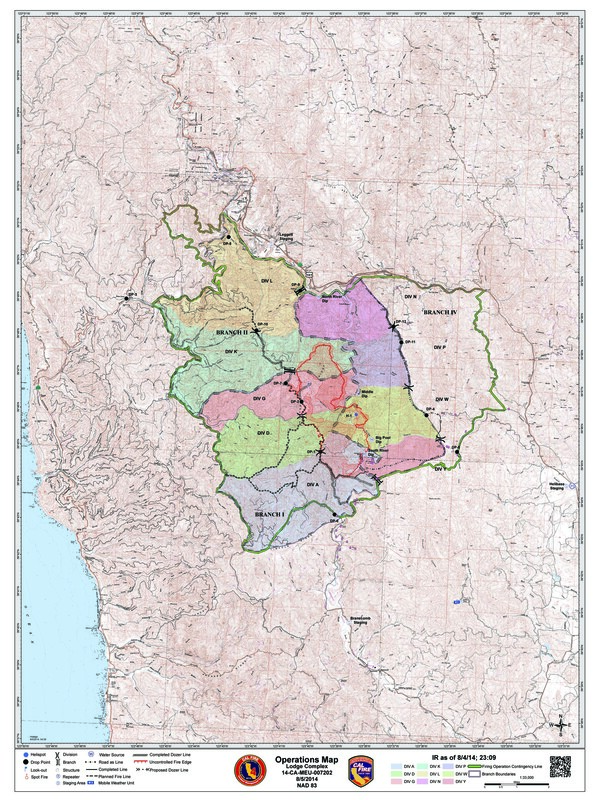 King Fire – Large fires can get split up into multiple zones. Lowell Fire – A progression map showing the spread of the fire with corresponding timeline. 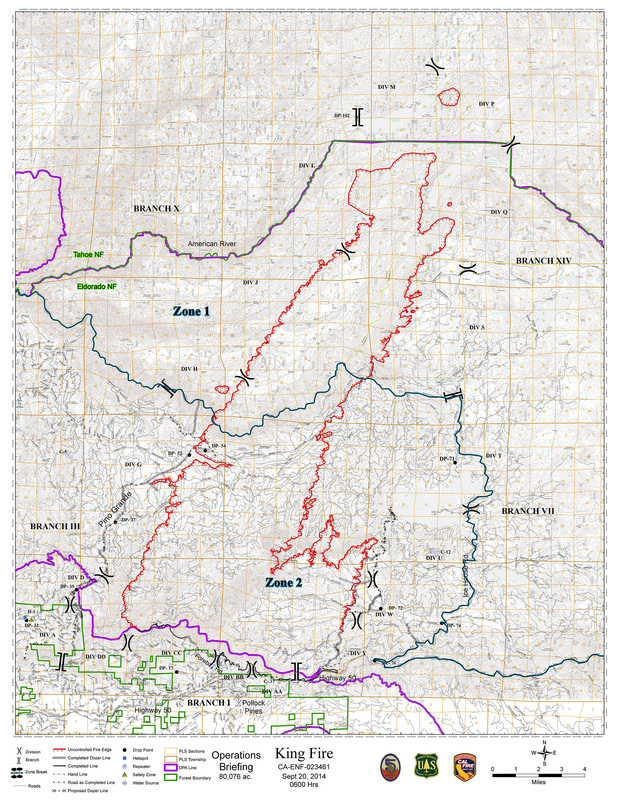 Lowell Fire – A fire history map shows fires that have occurred in the past near the active fire.